In the olden days of programming, back when you had to code by candlelight, it was considered acceptable to release beta versions that contained tons of bugs. For the most part, people avoided using beta software because they knew it could bite them. The only people who tried beta versions were hard-core geeks who knew what to expect. They expected show-stopping bugs, and plenty of 'em. Those days are over, though. The mainstreaming of software coupled with the increasing prevalence of beta versions has resulted in the widespread usage of pre-release software. People no longer consider "beta" to mean "use at your own risk." And given the years-long beta status of web applications like Gmail, who could blame them? These days, a lot of people get their first impression of your product by trying out a beta version. It doesn't matter if you warn people about problems - they'll still forever think of your work as low-grade crap if your beta isn't polished. If they run into any annoying bugs, they may steer clear of your software in the future. So unlike the carefree code-slinging days of my youth, today I've got to make sure my beta versions are as solid as possible. I have to treat public betas with almost as much care as the final release. In some ways I view this as a good thing, because it forces me to pay more attention to potential problems as I'm coding. But it's also a bad thing, because it's flat-out impossible to test desktop software with every possible combination of hardware and software that exists in the wild. I have to release a public beta in order to uncover bugs involving specific configurations, but quite often users who encounter these problems never report them - they simply uninstall the software and move on. Now that Techmeme (finally!) has a search feature, I figured I'd create a search definition which enables searching Techmeme from within FeedDemon. Update 07-Jun-08: Techmeme now supports the ability to return search results as an RSS feed, so I've updated the search definition to include this feature. 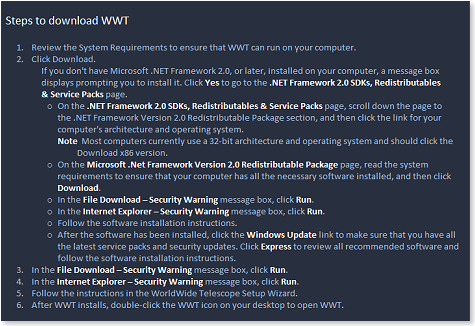 Microsoft's World Wide Telescope is an amazing piece of software. I installed it on my 8-year-old son's computer yesterday, and he spent a long time exploring the universe with it (and he said he can't wait to use it again). This strikes me as an excellent example of why desktop software is paralyzed by fear. Unless you're a power user, your reaction to this will be, "holy crap, I have no idea how to do all that!" And then you'll search Google for a web site that does what you need without requiring so much work. Those of us who believe that desktop software is still relevant in a browser-based world should be up in arms about how hard it is to install software (on Windows, at least - it's easier on the Mac). Multiple security warnings, required OS updates, and tech-heavy language make downloading and installing software too scary a prospect for non-technical users. The Future of Feed Reading: What Do YOU Want? Every now and then I'll see a blog post predicting the future of feed reading, and invariably it's written by someone who spends every waking moment reading their feeds. Which is fine, of course - we certainly want to know what power users expect from the future of RSS. But predictions from these folks are usually based on what they need from RSS, and their needs don't always match the needs of the majority. Most people who use an RSS reader don't live in it. They use it to stay up-to-date with the latest news from the blogosphere, to keep tabs on what people they trust are talking about, or simply to kill some time between more important tasks. This blog post is aimed towards these people - the ones who love their RSS reader, but don't feel withdrawal symptoms when they don't use it for a day. What do you want from your RSS reader in the future? If you could change the future of feed reading to suit your needs, what would you want that future to look like? As you can see from the release notes, there aren't many big new features in this version - unless, of course, you count speed as a feature :) The most significant change in version 2.7 is that it's much faster in many areas, including critical ones like synchronization and navigation. Note: If you have a previous 2.x version of FeedDemon installed, just install version 2.7 directly on top of it. Nine years ago, my father was diagnosed with Parkinson's disease. It's a testament to his character that he used that diagnosis not as an excuse to retreat from the world, but instead as a reason to become more engaged with it. Since then, he's traveled the world and become very involved with Rotary International, through which he has helped establish children's burn centers in Chile and AIDS clinics in Ethiopia. He was honored for his work by being named Rotarian of the Year, an accomplishment that he's very proud of. Late last year he suffered heart trouble, which led to a substantial decline in his mobility and speech, to the point where he became wheelchair-bound and could no longer be involved in his many charitable activities. Last month he opted to undergo deep brain stimulation (DBS), a surgical procedure that has had success in improving the lives of those who suffer from Parkinson's. Four hours into the surgery, we received word that it had been aborted. Two hours later we found out that an intraventricular hemorrhage had occurred - a vein had been hit, leaking blood into my dad's brain. This was a potentially life-threatening situation, and even if my dad survived, there was a good chance that his brain would be permanently damaged. The next two weeks were spent in the intensive care unit (ICU), during which time we experienced the incredible flaws in our medical system. The doctor, despite being a well-respected surgeon, was an extremely poor communicator, and did very little to help our family understand what was going on and what needed to be done. Rather than help us deal with the situation, he basically left it up to us to be in charge of communicating with the various staff involved in my dad's recovery. It is absurd that this situation exists. A sane system would assign the equivalent of a case worker to manage all aspects of an ordeal like this on behalf of the patient and their family. Instead, our family - already traumatized by seeing our father with tubes coming out of his brain, eyes rolled back into his head - was somehow expected to navigate the insurance-dictated (and ego-driven) landmine of our "modern" healthcare system with very little assistance. Although on the whole the nurses were excellent, there were some whose bedside manner was non-existent. More than once I had to force a new nurse to introduce themselves to my dad before poking and prodding him. Worse, nurses changed on a daily basis - we always had to make sure that the "nurse of the day" understood my dad's condition (often, they didn't), and we had to watch over everyone to avoid the mistakes that plague our healthcare system. We witnessed more examples of errors than I can recount here. Incorrect dosages of important medicines, failure to deliver medicine when required, ignoring alarms on machines attached to my dad, neglecting to change my dad's position (resulting in bed sores), bringing him solid food even though he couldn't even drink liquids - you name it, and we probably saw it. Soon after my dad became conscious, it was apparent that he was extremely confused, unsure of where he was or even which year he was living in. He was hallucinating, seeing people, animals and strange objects around him. One day he'd believe he was in Denver, CO, and the next he'd think he was in London. Some days he'd think I was someone who worked with him years ago, and he'd ask me to help him finish a work-related proposal despite having retired several years ago. As you can imagine, we were very worried that what he was experiencing was permanent. The doctor said he was most likely suffering from ICU psychosis, which often accompanies extended stays in intensive care (which makes you wonder why hospitals don't realize that any room that turns people psychotic needs some serious rethinking). But he couldn't rule out permanent brain damage. To make matters worse, we later discovered that the doctor didn't even take our concerns seriously. Every time we met with the doctor - which, it must be said, was an all-too-infrequent event - we asked what could be done to ease my dad's delusional behavior, but it wasn't until he experienced my dad's confusion himself a week later that he took any action to improve the situation. Regardless of whether the surgical mistake was a result of negligence, I firmly believe that this doctor had a moral responsibility to help our family in any way he could, and he failed to live up to that responsibility in so many ways. After two weeks in ICU, my dad was transferred to a non-critical care room. At first we were delighted, because we assumed it meant that he was recovering. But soon we were more worried than before, because my dad's "psychosis" caused him to believe that he could still walk. Despite his weakness, my dad's willpower was enormous, and his upper body strength was impressive. He struggled (and many times succeeded) to get his legs off the bed, and numerous times came close to lifting himself completely over the edge, yet the hospital staff consistently failed to respond to the bed alarm. Had we not been there, there is no doubt in my mind that he would've fallen off the bed and seriously injured himself. In fact, one day we stepped out to visit a rehab center for a couple hours, and returned to find him hanging sideways, with his upper body stuck in a painful position that made it harder to breathe. His lunch was on a tray in front of him - and was cold. He had been like that for at least 30 minutes (probably much longer), and nobody had checked on him despite the ringing bed alarm. We had to stay with him every night to keep him safe, and every night was a sleepless exercise in explaining to him that he couldn't walk yet, being careful to do so in a way that didn't lead him to believe we were keeping him captive. Ten minutes after he said he understood, he'd be at it again. It was excruciating for both him and us. After a week of this, and a week of complaining to the staff about it, the hospital finally told us they could assign a "sitter" to watch over him at night. Had we known we could get a sitter before then, we could've saved ourselves a lot of needless suffering. After a week of being out of ICU, my dad's psychosis didn't go away. Not only was he still hallucinating, but at times he was also paranoid, believing that we had somehow created an exact replica of the hospital and imprisoned him in it to make him believe he was in a real hospital. I was only able to convince him otherwise by reminding him of Occam's razor, a scientific principle which basically says that when a situation has multiple answers, the simplest one is usually correct. The simplest answer in this situation was that he was actually in the hospital, and was suffering from post-op confusion that led him to believe otherwise. My dad had spent over forty years in the in the nuclear power industry, both as an engineer and as a manager, so appealing to his sense of reason provided the best results in many similar situations. The doctor still believed that ICU psychosis was to blame for his behavior, but we were increasingly convinced that it was the result of his changing my dad's medication, especially his dosage of REQUIP, which is commonly prescribed to Parkinson's patients and is known to cause delusions. Once the dosage was significantly reduced, my dad's behavior became much more predictable, and he stopped suffering from paranoia and hallucinations. In my opinion, my dad's doctor should've recognized this long before we offered it as a possible solution. Earlier this week we moved my dad out of the hospital and into a rehabilitation center, which should've been a reason for joy but instead resulted in even more trouble. To my shock, the ambulance that transferred him wasn't air-conditioned, a terrible situation for a patient who was already dehydrated. He spent the entire 90 minute trip perspiring like mad, strapped to a stretcher that made his bed sore excruciating. When we arrived, we found that the hospital hadn't provided the rehab center the correct information about his meds, resulting in him not receiving important medicine for an entire night. As a write this, it is now my dad's second day in rehab, and I'm happy to report that things are going well so far. We chose a rehab center that's surrounded by trees and natural beauty, a welcome change from the four walls of an impersonal hospital room. I took him on a tour of the outdoors in his wheelchair, and you could almost feel the improvement in his well-being. Honestly, I don't know yet whether to be hopeful, because he's suffering from so many different issues, and we know he will remain permanently changed by this failed surgery. But his inner strength has pulled him through seemingly insurmountable situations before, and we want to count on it pulling him through this one. I could end this post here, but instead I want to say how absolutely disgusted I am with our healthcare system. Far too many times I had to shout at people to get them to act. I witnessed far too many mistakes - many of which I haven't mentioned here - and encountered far too many uncompassionate people to ever believe that our medical system is working. Numerous friends I've spoken with have recounted similar horror stories, as I'm sure many readers here will, too. My father is a wealthy, well-connected, fully-insured, brilliant man, and this all took place at what is supposed to be one of the best hospitals in the country. If the healthcare system failed him, it will fail the rest of us, too.